Artist's illustration of the ExoMars Trace Gas Orbiter at Mars. PASADENA, Calif. — The ExoMars 2016 mission is in business despite the apparent failure of its lander to touch down softly on the Red Planet Wednesday (Oct. 19), European Space Agency (ESA) officials stressed. The lander, known as Schiaparelli, seems to have deployed its parachute too early and fired its thrusters for an insufficient amount of time as it streaked through the Martian atmosphere Wednesday, ESA officials said. Still, ExoMars team members continue to analyze data and have not yet officially declared the lander dead. TGO aced this maneuver and is now circling the Red Planet as planned. 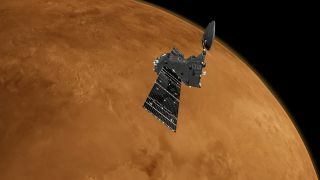 "Following yesterday's events, we have an impressive orbiter around Mars ready for science and for relay support for the ExoMars rover mission in 2020," ESA Director General Jan Wörner said in a statement Thursday (Oct. 20). Launched in March 2016, Schiaparelli and TGO zoomed across the solar system together for seven months. Schiaparelli separated from TGO on Oct. 16 to line up its landing attempt. The plan called for Schiaparelli to touch down Wednesday morning using a combination of aerobraking, thrusters and a parachute to slow its descent. Less than a minute before it should have reached the ground, however, mission controllers lost the lander's signal. In the seemingly unlikely event that Schiaparelli did manage to land safely, it should have some data onboard. The Combined Aerothermal and Radiometer Sensors Instrument Package (COMARS+) monitored the conditions Schiaparelli experienced as it plummeted toward the ground, while the Descent Camera (DECA) captured 15 black-and-white images during the descent. Schiaparelli is primarily a demonstrator module designed to test entry, descent and landing technologies for future missions, including the life-hunting rover that ESA and its chief partner on the two-phase ExoMars program, the Russian space agency Roscosmos, plans to launch in 2020. As a result, the lander was designed to have a short lifetime; it was built with nonrechargeable batteries that would last for just a few days on the Martian surface. The original plan called for Schiaparelli to measure wind, humidity, pressure and temperatures for that brief stretch. The lander would also peer up through the atmosphere to determine its transparency and study the atmosphere's electric field — a phenomenon produced as dust lofted into the air forms clouds that discharge electricity. "The electric field can be larger than it is on Earth," Witasse told Space.com. "That matters if we send humans to Mars." For example, a massive enough electric field can help shield astronauts from dangerous radiation that slices through the thin Martian atmosphere, researchers have said. TGO will relay data from the ExoMars 2020 rover, but the orbiter will also do quite a bit of science work of its own. TGO is currently in a highly elliptical, four-day-long orbit of Mars. In January 2017, the spacecraft will begin moving into an orbit more conducive to data collection. If all goes according to plan, TGO will reach that orbit — a circular path with an altitude of 250 miles (400 kilometers) — in March 2018, at which point it will begin its two-year science mission. According to Ann Carine Vandaele, the principal investigator of the Nadir and Occultation for Mars Discovery (NOMAD) instrument on TGO, the orbiter will perform a full inventory of the types of molecules in the Martian atmosphere. One of the many mysteries TGO should address is the origin of Mars' atmospheric methane. According to Witasse, methane could come from either geological processes in the crust or from organic sources. This latter possibility is of course intriguing to astrobiologists, some of whom believe that microbial life might exist on Mars today. "That’s a very hot topic," Witasse said. Because TGO will be combining multiple observations, "it will produce a three-dimensional version of the atmosphere," Vandaele told Space.com. TGO will gather data for two years, so the spacecraft should also pick up any changes over time, often referred to as the fourth dimension. "We will have a four-dimensional view of the Martian atmosphere," Vandaele said. Most importantly, she said, TGO will help prepare the ground for the ExoMars 2020 rover by providing a global view of the Red Planet now and developing the chemical context for what the next mission might discover. "The main scientific mission is to back up the 2020 mission," Vandaele said. Follow Nola Taylor Redd on Twitter @NolaTRedd, Facebookor Google+. Follow us at @Spacedotcom, Facebookor Google+. Originally published on Space.com.